We have specially designed Conveyor for Batch Printing for bottom edge coding with the full bottom coding system. We have designed and built it with applications like Variable Speed, Reversible Direction, Stainless Steel Or depending on production requirements. It is arranged horizontally to adopt non-metal wear-resistant material. Also, useful for most of all industries like chemical industry, machinery, metallurgy, light industry, food, medicine and much more. 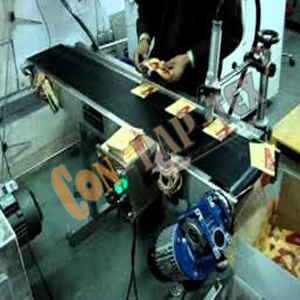 Conveyor running good while printing materials on Batch Printing Machine.